Our complete Blower / Cyclone combinations come in a compact, space-saving package. 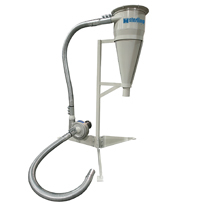 These units are ideal for press-side, auger-feed, and robotic-feed granulators. Each combo is a complete system, consisting of an AL-4 blower, cyclone, combo stand, and interconnecting tubing and fittings. These systems feature a modular, self-contained design. 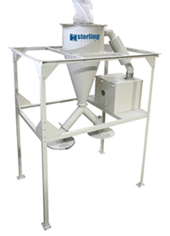 Compact and portable, they can easily be moved from one location to another for use with more than one granulator.